Шаблоны VirtueMart — это основанное на PHP приложение, которое позволяет организовать на сайте Интернет-магазин. Он является компонентом (и плагином) для CMS Joomla и не может быть использован отдельно от Joomla. Он легко устанавливается с помощью автоматического инсталлятора компонентов и модулей. VirtueMart ориентирован на создание малых и средних Интернет-магазинов. Kind of shops This template is perfect for security, military, sport, gifts, and business websites. Owners of firearms need durable holsters in order to conceal their weapons and keep them secure even when active movements are performed. Choosing a holster, people usually focus on its quality rather than a price, that's why manufacturers should highlight high standards of their products. To put emphasis on such an aspect, it's a good idea to turn to this theme. 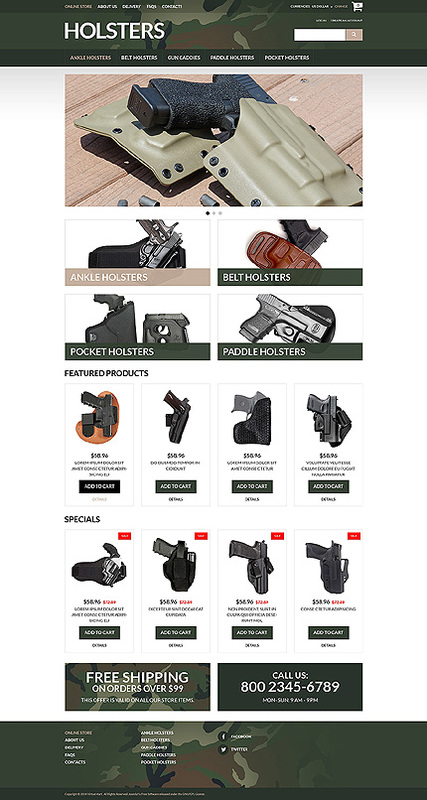 If you create an online store with its assistance, it'll look like a serious and reliable provider of holsters, which will encourage customers' confidence in its offerings. As items are presented against the background of a khaki color scheme, people will believe in their ability to assure maximum security, and there'll be no accidental shots that could wound them. Give a try to this theme to attract owners of firearms who value precautious measures above all.